Have you experienced the loss of one or more teeth? 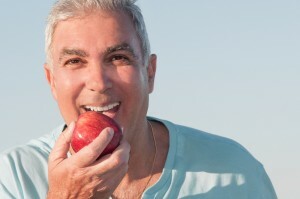 Ascot Aesthetic Implants & Dentistry can help you restore what’s been lost with dental implants. This popular and effective restorative dentistry service creates natural results through the combination of one or more metal implants posts, plus a new crown, bridge, partial, or full denture. The post portion of dental implants have the job of anchoring your new restoration to your jaw, in much the same way as a natural tooth root would. Your tooth roots are important because they anchor your teeth to your jaw, but also because they encourage your jawbone to grow new bone tissue throughout your life. With one or more tooth roots missing from your smile, your jawbone will begin to weaken, eventually putting nearby teeth at risk of being lost as well. Dental implants can help you preserve remaining teeth and strengthen your jaw by mimicking the relationship between the jaw and a natural tooth root. Treatment with dental implants is completed in two stages. In the first stage, one or more implants are surgically implanted in the jaw. After a healing period, in which your implant(s) has had a chance to bond with the bone in your jaw, you’ll come back to Ascot Aesthetic Implants & Dentistry to have your new restoration attached. Dental implants aren’t right for every patient, though. A consultation with our Fayetteville dental team will help us decide what course of action is the best for your particular needs. To schedule an appointment with Dr. Angela Ruff, don’t hesitate to give us a call. Dr. Ruff is happy to offer restorative care to patients from Fayetteville, Spring Lake, and all of Cumberland County.